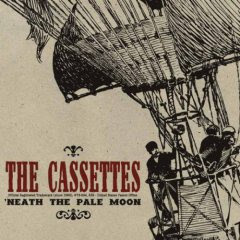 The Cassettes are a side project of former Frodus/Decahedron singer Shelby Cinca, playing an eclectic mix of psychedelic rock, punk, twangy country, and beatles inspired pop rock. The instrumentation here matches the equally bizarre sound crafted by the band. Cinca plays a resonator guitar, another member of the band simultaneously plays an accordion and a Moog synth, a creepy bald guy plays the thermamin (and yes, there are killer theramin solos) and a Hare Krishna looking guy switches between the tabla and regular drums. This is one of the better records released last year, and easily one of the most original as well. thanks for fixing the link, hot stuff. and i really like this album. Thanks man for the fixed link! I'm downloading it now! Cheers. I wouldn't call The Cassettes a side project. It's a full-fledge band, actually. But one thing I agree with you is that they are awesome! The Cassettes podcasts are great experience, too.